Last week, as I was casually perusing YouTube for purposes of procrastination, I stumbled across an attention-grabbing headline: "Science Finds God Inside Of Us." Instantly intrigued, I gave the video a click. My laptop screen was quickly adorned with the image of a man dressed in black, wielding what I presumed to be a Bible in his left hand. He had sharp, hawkish features and short, styled hair smattered with gray. He was delivering a sermon to a crowded hall and a tiny wisp of air trailed many of his spoken words, as if to give the impression that a great, secret truth was leaking out. "I'll tell you how you can know tonight that God will always hold you together no matter what," he said, almost in a whisper. "It's a little protein molecule called laminin." The man, I later found out, was Louie Giglio, a prominent Christian pastor (with over 250,000 Twitter followers) and founder of the Passion Movement. As I more swiftly learned from his YouTube sermon, he loves laminin. From a scientific standpoint, this is completely understandable. Laminins are a group of glycoproteins which are absolutely vital for the maintenance and survival of living tissues in all organisms. They are integral to structural scaffolding and influence cell differentiation, migration, and adhesion. What's not to love? "How crazy is that? The stuff that holds our bodies together, that's holding the lining of the organs together, holding your skin on, is in the perfect shape of the cross of our Lord Jesus Christ!" Giglio boisterously proclaimed. To Giglio, and others, this revelation provides proof of God's signature on his living creations. 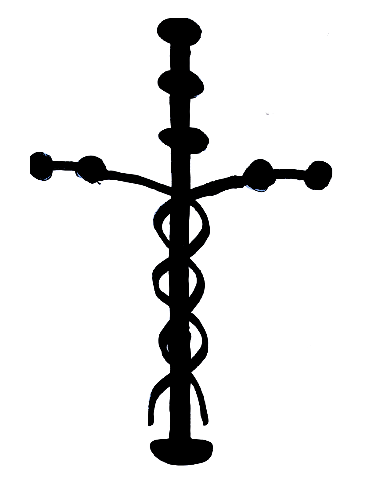 "You would never in a quadrillion years convince me that is anything other than the mark of a Creator who knew EXACTLY what laminin "glue" would look like long before Adam even breathed his first breath!!" spouts an anonymous online believer. You can even purchase T-shirts and coffee mugs glorifying the protein. "Great designers always leave their mark," one of the designs says. 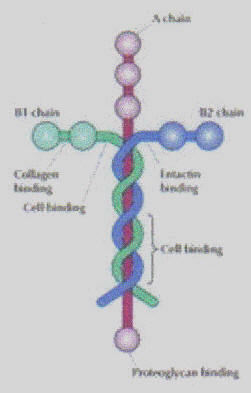 So is laminin proof of God's existence? Simply put, no; it's just another example of pareidolia. Some religious people see an image of a cross and instantaneously perceive it as significant. It's like finding the Virgin Mary in a grilled cheese sandwich or witnessing Christ in a tortilla. 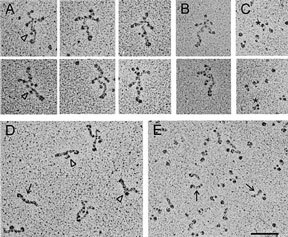 When looking at laminin under an electron microscope, the resemblance actually diminishes significantly. I think the protein looks more like a flower personally.